Although they don’t currently have as much conductivity, solid-state electrolytes designed for lithium-ion batteries (LIBs) are emerging as a safer alternative to their more prevalent—sometimes flammable—liquid-electrolyte counterparts. A new study conducted at Oak Ridge National Laboratory’s Spallation Neutron Source (SNS), a Department of Energy Office of Science user facility, has revealed promising results that could drastically boost the performance of solid-state electrolytes, and could potentially lead to a safer, even more efficient battery. 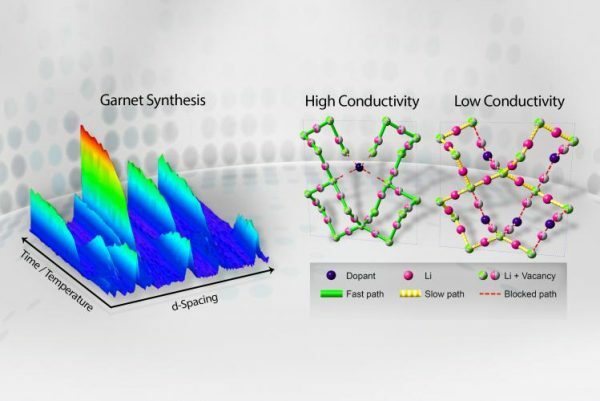 Using neutron diffraction techniques via the VULCAN instrument, the team concluded an in-depth study probing the entire structure evolution of doped garnet-type electrolytes during the synthesis process to unravel the mechanism that boosts the lithium-ionic conductivity. Their findings were recently published in the journals Chemistry of Materials and the Journal of Materials Chemistry A.